The U-M Student-Run Free Clinic offers high-quality, compassionate care to those in need. It was cold — the first Saturday of 2018, and the third day in a row of single-digit temperatures. 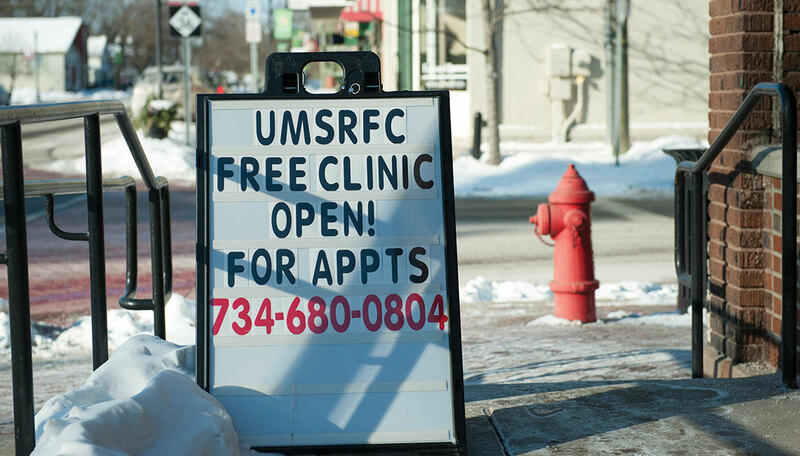 The caregivers-in-training volunteering at the U-M Student-Run Free Clinic (UMSRFC) in Pinckney were expecting a resultant lull in walk-ins and the cancellation of appointments. But at 8 a.m., when doors opened to the public, the first of many patients arrived. Some had respiratory infections or sinus issues, exacerbated by the sub-zero temperatures; most, however, were being seen for larger problems: diabetes treatment, heart problems, hypertension. “Many times our patients are here for a chronic health concern,” says Justin Joseph, a first-year medical student at U-M and outreach coordinator for the clinic. Michelle Ng, a first-year medical student, reviews patient information with Angelica Willis (M.D. 2018), MPH. This might surprise some. Free clinics are often depicted as high-volume, low-resource “one-stop shops,” where patients without insurance receive simple, uncomplicated treatments — and then are never seen again, says Joseph. But the UMSRFC is different: It prides itself on being able to treat complex cases thanks to a robust, interdisciplinary team that offers its services every Wednesday and Saturday. A core group of Medical School student leaders coordinates with volunteers from the Medical School and School of Nursing, along with students from the School of Dentistry and the College of Pharmacy, to provide patients with the highest quality of care. With the help of onsite Medicaid application counselors, they also sign patients up for applicable insurance and benefits. Faculty from the departments of Psychiatry and Obstetrics and Gynecology round out the team by offering specialty care once a month. Founded in 2011 by U-M medical students with the support of the Medical School Office of the Dean, the UMSRFC is located on the main drag in downtown Pinckney, a rural village of about 2,500 people in Livingston County, Michigan, 30 minutes from the university’s Ann Arbor campus. The students chose Pinckney as their hub because Livingston County, which spans almost 600 square miles, didn’t have a single free clinic prior to the UMSRFC’s establishment. “The patients tell us all the time how much they appreciate students talking to them, taking time to look at not only their medical issues but also their social issues, their insurance issues, what issues are preventing them from seeing doctors.” —Hari Conjeevaram, M.D. The patient visit itself is highly collaborative: Two students — one early in their education, and the other more advanced — interview the patient, collect a medical history, and perform relevant physical exams. The senior student intervenes as much or as little as the junior student needs; being able to play off one another’s expertise builds confidence and promotes communication. The two then present the patient’s concerns, as well as their initial diagnosis, to the onsite faculty member, who also meets with the patient and signs off on a treatment plan. In October 2016, the School of Nursing officially began holding Wednesday clinics, with administrative roles staffed primarily by nurse practitioner (NP) students and with clinical teams comprising an NP student and either a first-year medical student or pharmacy student. It expands the clinic’s reach and provides more opportunities for walk-ins, says Eagle, who precepts on Wednesdays. For her, the entire experience has been immensely fulfilling, and she encourages faculty to volunteer their time. “It’s a wonderful opportunity to be able to focus on quality patient care and quality teaching,” she says. One of the clinic’s most important assets is its ability to provide select medication for free, as well as referrals for free laboratory blood testing and imaging studies. “We are one of the few student-run free clinics in the entire country to do that,” says Conjeevaram. Accessibility to these services is a boon for patients and, ultimately, it can mean the difference between adhering to treatments and foregoing them altogether. Some patients travel hours just to receive these benefits. The clinic welcomes this: Its doors are open to anyone, regardless of where they live, says Joseph. Moreno is one of about 30 student translators who volunteer at the clinic. Owing to U-M’s diverse student body, UMSRFC can accommodate patients who speak Mandarin, Russian, Tagalog, and Arabic, among others. It is paramount that the clinic is able to meet patients where they are, Joseph explains. Sometimes, that could mean having someone in the room who understands not only the language, but the cultural underpinnings that shape one’s expectations of health and the doctor-patient relationship.